Saanich is a district of the Greater Victoria Area, located on Vancouver Island, British Columbia. The District of Saanich is currently preparing a draft land use plan for a busy traffic corridor to be titled the Uptown-Douglas Corridor Plan. The Plan will be based on the Uptown-Douglas Corridor Plan Framework Report. One of the project objectives contained within the framework report is to ‘integrate public realm improvements and land use changes to support the development of complete streets and the future introduction of rapid transit on Douglas Street’ (p. 4). The plan also includes the initiative to transform Blanshard Street and Vernon Avenue into Complete Streets complete with preliminary policy directions (p. 12). The Draft Uptown-Douglas Corridor Plan is targetting release in Spring 2019. 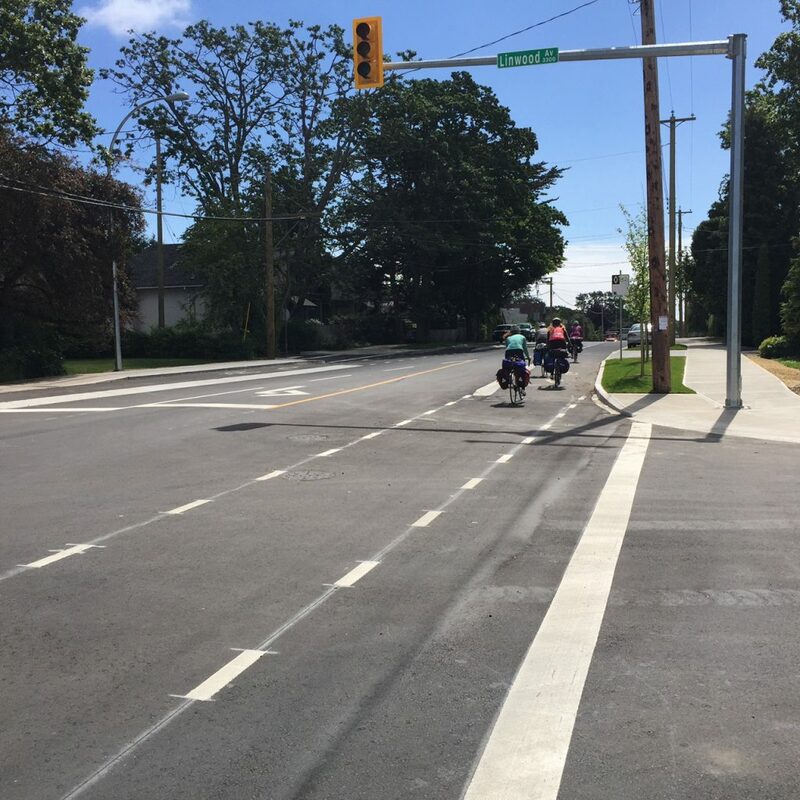 Construction for the first street in the District of Saanich (BC) to undergo redesign under Complete Streets was completed and opened to the public in May 2015. Nine hundred meters of Cook Street has been upgraded to “reduce GHG emissions, improve stormwater quality, increase safety for all communters and provide an inviting environment for residents,” according to Saanich’s recent news release. Construction for this 5.6 million dollar project began in August 2014 as a project under the neighborhood’s Quadra Local Area Plan. Cook Street’s renovations reflect this community plan’s vision to create vibrant, inclusive, and safe neighbourhoods for drivers, pedestrians, and cyclists in the area. Specifically, Cook Street’s upgrades consist of: new asphalt on the roadway, 1.8 kilometers of new and refurbished sidewalks and cyclist lanes, new underground municipal utilities, traffic safety improvements, and 45 new trees planted alongside the road. Cook St is the first of three projects in Saanich, which together form the Complete Streets Concept Design Project, launched in 2012. Glanford Ave (see project documents) and Tillicum Road between Carey Road and the Trans Canada Highway (completed 2015, see project documents) make up the other two. Read the full news release for Cook St, or the project documents. The District of Saanich released their Moving Saanich Forward: Active Transportation Plan in May 2018. The Active Transportation Plan states that the goal is to build on the 2015-2018 Strategic Plan. The Active Transportation Plan states that one of the goals* in the 2015-2018 Strategic plan is to: ‘design and construct “Complete Streets” (p.13).’ The Active Transportation Plan provides detail about how they are going to achieve this goal. *We were unable to find this goal in the 2015-2018 Strategic Plan.